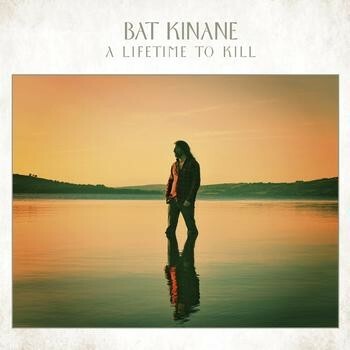 Best known for his guitar playing and song writing with the criminally under rated Irish rockers Glyder, and hot on the heels of their excellent ‘Yesterday, Today & Tomorrow’ album, comes Bat Kinane’s first solo album, ‘A Lifetime To Kill’. Like all interesting solo albums, what this release does is illustrate a different and pleasantly unexpected side to Kinane that his main band only hint at. Always one for baring his heart in his lyrics, that process goes even further on these stripped down, bluesy, folky, country and in some places slightly Americana influenced songs that see Kinane write about life, love, inspiration and the frustrations of trying to earn a living from his music. Also featured on the album is Dave Roe, who was Johnny Cash’s bass player for ten years, along with appearances from Rob Strong, Mama’s Boys Pat McManus and Bat’s Glyder band mates Davy Ryan (who plays drums on the whole album), Tony Cullen and Pete Fisher who help out on a couple of songs. The disc kicks off with the light and airy breeze of ‘The Yellow Moon’, which builds beautifully into a chorus that is instantly memorable, with some fantastic acoustic strumming and a guitar line that sticks in the mind for days to come. In a just world this song would be a worldwide hit, with its melancholic theme, yet upbeat vibe. ‘Voodoo Bones’, which has a great lyric about some of the inspirational musicians who are no longer with us, struts with purpose. The fiddle infused country rock track ‘The Intrepid Fox’, which is where Pat McManus guests, strikes you with an easy going, yet seductive nature and it really is a feature of the songs on this album, where the mood and atmosphere is every bit as important as the well thought out structures. The singer/songwriter approach of ‘You Know You Have A Friend’ brings the pace of the album right down, before the most Glyder-ish song ‘Star-Struck ‘74’ crashes into view with a thumping bass line and riff that have you moving instantly. Once more Kinane paints a vivid image with his words, which is so strong that just like Bat himself, you yearn to be transported to 1974 to witness Rory Gallagher on stage. Kinane will be the first to admit that he doesn’t have the strongest singing voice, however the personal emotions that run through all the lyrics on this album really mean that it needed to be him that sings these songs and the likes of the piano led Bruce Hornsby vibe of ‘No Turning Back’, or the beautiful acoustic number ‘My Song’, are more believable for having their creator sing them. ‘A Lifetime To Kill’ may not be the album you would have expected from a member of Glyder, however it is all the stronger for being so and is a fantastic and welcome change of pace from an extremely talented song writer.